And tens of thousands left the 2013 March on Washington hearing vows to push Congress to restore voting rights gutted by the Supreme Court and plans to lobby Congress for passage of a jobs bill. But divided legislators have shown little willingness to cooperate on anything and Republicans have been moving in states to change requirements and stifle voter participation, say civil rights groups. “Why when we get to Obama do we need some special i.d.? When they ask us for our voter i.d. take out a photo of Medger Evers, take out a photo of Goodman, Chaney and Schwerner, take out a photo of Viola Liuzzo. They gave their lives so we could vote,” said Rev. Sharpton. 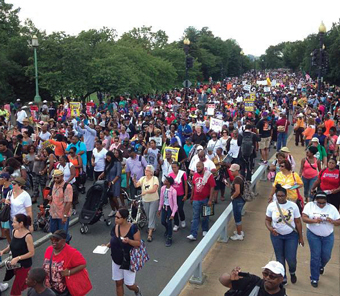 Click to Read: Dr. Boyce Watkins offers candid view on 2013 March on Washington. If Congress fails to pass a jobs bill, marches need to continue and sit-ins held in the offices of the powerful to say people want to work, he said. In 1963 Dr. King said the check for justice was marked insufficient funds, but we re-deposited the check, and it was marked stop payment, said Rev. Sharpton. They had money to bail out banks and corporations, to give tax breaks to the rich but not pay for Head Start, city workers or teachers, he said. “We’re going to make you make the check good or we are going to close down the banks,” declared Rev. Sharpton, whose prominence showed a remarkable trajectory for a man once reviled as an irresponsible firebrand for his protests and direct action in racially charged New York cases. He spoke to Black youth saying civil rights martyr Edgers didn’t die for a right to thug-life and there was a need for greater Black-on-Black respect. Entertainers should not disrespect Black women for any price, nor disrespect icons like Rosa Parks and Fannie Lou Hamer, said the Rev. Sharpton. And, he added, Black youth need good education and opportunity, not racial profiling, inferior education and lectures. If youth are engaged, taught well and given opportunity, they will pull up their pants without chiding from elders, he said. “Don’t act like whatever you have achieved you achieved because you were that smart. You got there because some unlettered grandmas, who never saw the inside of a college campus out their bodies on the line in Alabama and Mississippi and sponsored you on campus,” Rev. Sharpton warned successful Blacks. A price was paid for your personal advancement and a debt is owed to those who forged the way, he said. The sun shone bright on the historic Saturday as a sea of issues and multi-racial crowd turned out. Black fraternity and sorority members proudly sported their Greek letters and colors, as did labor union members, local activists, and local chapters of the major civil rights organizations. T-shirts with historic images and current social and racial justice causes were in abundance. Parents lofted children on their shoulders. Wheelchairs shuttled others closer to speakers or fronts of lines. Some were shaded by trees, some used placards, umbrellas and t-shirts to find respite from the sun. Free bottles of water were handed out. Lawn chairs and blankets were laid near those leaning on security barricades or sitting on grass. Some came to honor parents and loved ones who had been at the ’63 march, others came back to relive a significant moment in their lives. Adults and youngsters came in the name of Trayvon Martin, the teenager killed in Florida by a self-appointed neighborhood watchman. Trayvon, whose killer went free and whose family was at the commemorative march, has been called the martyr for activism today as teen Emmet Till was a catalyst for civil rights activity in 1955. Young Till was killed in Money, Miss., where the Chicago resident was visiting family and accused of disrespecting a White woman. He was beaten, shot, necktied with a fan and dropped off of a bridge. Marchers listened as old problems of racial discrimination, unemployment, police targeting, inferior education, and workers rights were listed alongside new issues of mass incarceration, fratricidal violence, lesbian and gay rights, immigration, abortion protections, protections from mortgage fraud and even a call quick for reparations. 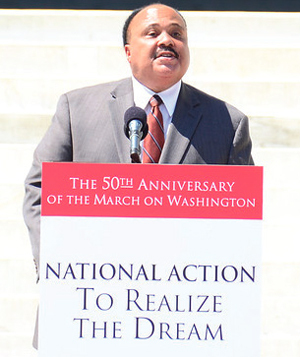 Martin Luther King III, who spoke before Rev. 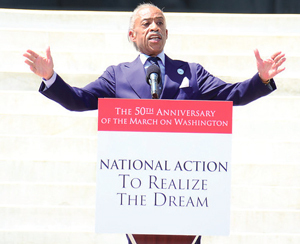 Sharpton, told the crowd stretching from the Lincoln Memorial to the Reflecting Pool on the National Mall that the King Dream was unfinished. Reform of state Stand Your Ground laws, which allow for use of deadly force if an alternative is possible; comprehensive immigration reform; stricter gun control and federal anti-racial profiling laws are needed, said the founder of Realize the Dream and former chairman of the Southern Christian Leadership Conference founded by his father. America needs a domestic Marshall Plan that can bail out Detroit, help other struggling cities and assist historically Black colleges and universities, he added. John Lewis, the last living speaker from the 1963 march, was beaten in Selma, Ala., as Blacks organized and mobilized for the right to vote two years later. “I gave a little blood on that bridge in Selma, Ala., for the right to vote,” said onetime activist who is now a congressman from Georgia. “I am not going to stand by and let the Supreme Court take the right to vote away from us. You cannot stand by. You cannot sit down. You’ve got to stand up. Speak up, speak out and get in the way,” he told the crowd. “It is time for us to do something to stand for something, to march for something,” said Rep. Marcia Fudge, who chairs the Congressional Black Caucus. In1963, there were only 6 Black members of Congress, today there are 43 members, said the Democrat from Ohio. “Civil rights is unfinished business and each one of us need to make it our business,” she added. The speakers list ranged from civil rights leader Jesse Jackson to Myrlie Evers-Jackson, whose husband Medger was murdered in the driveway of their home as she tended to their children. Younger leaders like Rev. Jamal Bryant of the Empowerment Temple and Rev. 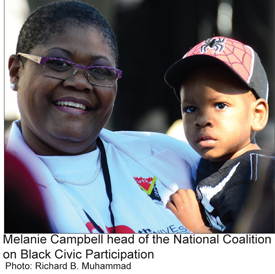 Lennox Yearwood of the Hip Hop Caucus delivered 2-minute remarks, while Urban league CEO Marc Morial, NAACP leader Ben Jealous, and Melanie Campbell of the National Coalition on Black Civic Participation delivered longer messages. Advocates for immigration, union, education, advocacy, womens’ rights, worker rights, lesbian and gay, Asian American, Latino and abortion rights groups and academics spoke. Attorney General Eric Holder claimed the day and the march in 1963 as a victory. That work opened the way for the first Black attorney general and the first Black president, said Mr. Holder. “They marched in spite of animosity, oppression and brutality because they believed in the greatness of what this nation could become and despaired of the founding promises not kept,” he added. But while the celebration and commemoration were spirited and filled with moving symbolism, there were also questions about its tone, agenda, destination and shut out of some voices—including Min. Louis Farrakhan of the Nation of Islam. 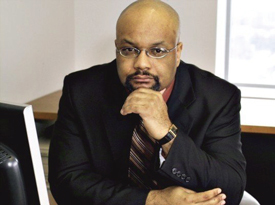 Dr. Boyce Watkins, a Black analyst and writer, said it was not surprising Min. Farrakhan was not invited. Dr. King himself would be too radical to speak today, added the Syracuse University professor. The failure to speak to poverty, a major focus of Dr. King, is one example of the diversion from the slain civil rights leader’s path and message, he argued. Dr. Cornell West of Princeton is a leading voice on the U.S. failure to address poverty but was not invited to the march, Dr. Watkins observed. A portion of Black leadership has been “hijacked by the Obama administration politically,” Dr. Watkins continued. So the issue most often dealt with by march leaders was voting rights, an issue the Democratic Party and liberal establish permit these leaders to pursue, he said. 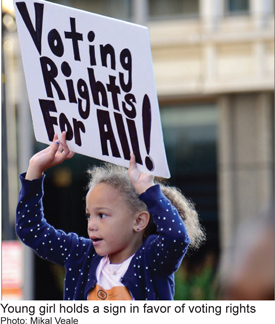 Voting rights and elections keep Black America inside the sphere that the Democrats and so-called allies approve of and control, said Dr. Watkins. Not inviting Minister Farrakhan to the march is “in some ways honest” and not surprising, he continued. The Minister brings a message of independence and strength that doesn’t require or connect with validation, love, and support from White people, said Dr. Watkins. The weekend gathering was clearly the King-integrationist trend in Black America and unapologetically so, observed Dr. Ron Daniels of the Institute of the Black World 21st Century. The group is unlikely to have Min. Farrakhan and those of the Black nationalist bent front and center, he said. Dr. Daniels’ group issued an “IBW Black Paper on the Last Half Century of Struggle.” It called for boycotting Florida as a way to punish those who offend Black interests and promote a willingness to fight back. He was not surprised a Florida boycott was not on the “21st Century Agenda for Jobs and Freedom” released the day before the march. “Unlike the march in 1963, organized by socialist intellectuals A. Phillip Randolph and Bayard Rustin, the updated version featured politicians, media personalities, and even the public-relations presence of Coca-Cola and Pepsi,” observed Courtland Milloy, the longtime Black columnist for the Washington Post. “The result was a day filled with irony as speakers criticized a status quo that some black leaders have helped to maintain,” he wrote in an Aug. 25 column.